Monterey County has no shortage of unique attractions, events, and adventures. 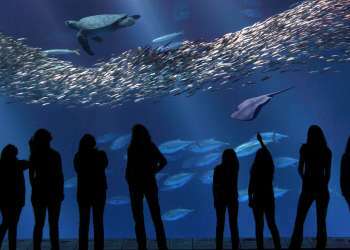 Foodies, music lovers, outdoor enthusiasts, and families alike can all find their ideal activities during a trip to Monterey. 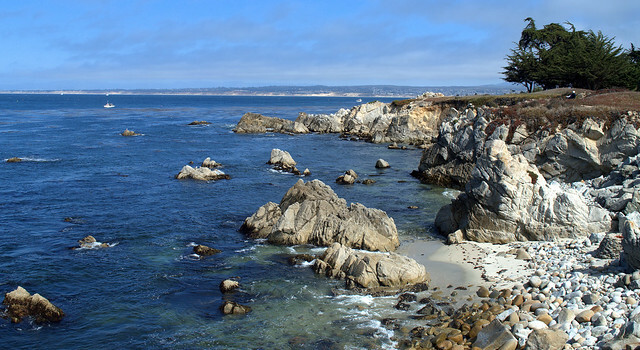 Here are some of the top reasons why Monterey should be the next stop for your future travels and explorations! Dubbed as the “Whale Watching Capital of the World” the Monterey Bay attracts a variety of whale species year-round whose populations peak during migration months. Humpback, Blue, and Grey whales are the most common but Orcas and the occasional Sperm Whale are known to make appearances. The bay’s submarine canyon, which is larger in size than the Grand Canyon, creates a climate that is ideal for animals that whales feed on krill and allows whales to safely journey close to shore. 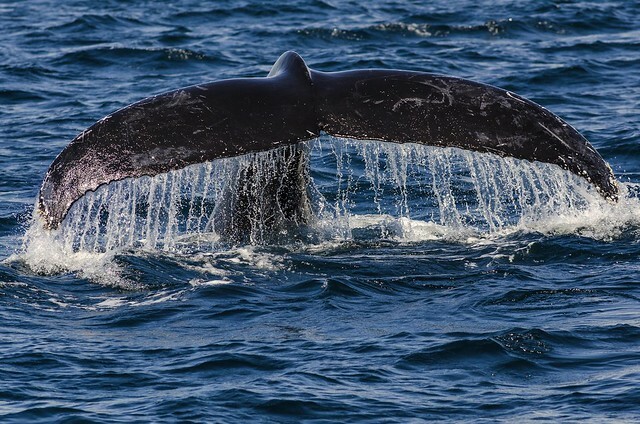 Monterey and Moss Landing are particularly prime spots for whale watching tours with the guides who are experts on the Monterey Bay’s thriving marine life. Monterey County plays a host to a wide range of events and festivals that pack the calendar year-round. The Monterey Jazz Festival in September is the longest continuously running jazz festival in the world and has featured celebrated musicians such as Louis Armstrong, Miles Davis, and John Coltrane. Car events are hosted regularly at renowned racetrack Mazda Raceway Laguna Seca and the Pebble Beach Concourse d’Elegance is a pinnacle event for antique and luxury car enthusiasts. Golf fans flock to the famous golf courses of Pebble Beach in February for the AT&T Pebble Beach Pro-Am. The breathtaking Big Sur International Marathon attracts runners from around the globe to compete in one of the most picturesque marathons in the world. Pebble Beach Food and Wine Festival held in March is a must for foodies and wine aficionados who want to eat top quality food prepared by celebrity chefs. 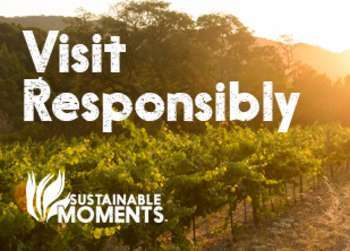 Be sure to check out SeeMonterey.com’s event calendar to find out more and help you plan a trip around your favorite event. The Salinas Valley is one of the most productive agricultural regions in the world which has earned it the title of “Salad Bowl of the World.” Locals and visitors alike benefit from the deliciously fresh produce that is truly “farm to table.” Top chefs such as Cal Stamenov of Lucia Restaurant at Bernardus Lodge in Carmel Valley and Brad Briske of La Balena in Carmel-by-the-Sea bring the flavors of Monterey County to life in their dishes by sourcing seasonal and local ingredients. 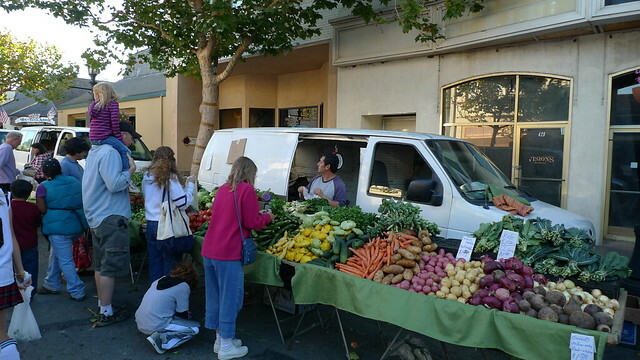 Those looking to get their hands on farm fresh ingredients can peruse one of the many local farmers’ markets that take place around the county. Fresh flowers, mouthwatering fruits and vegetables, locally produced snacks and drinks, as well as artists and entertainers can be found every day of the week! Monterey County is built on a foundation of rich history that is reflected in many of the buildings and monuments still standing today. Several Native American groups called the Monterey Bay area home, most notably the Esselen and Ohlone tribes. The county was also a stop on the California Mission Trail and both the Soledad and Carmel Missions were erected during Spanish colonialization. Monterey was later named the first capital city of California and a bustling hub of activity flourished in the fishing and canning industries. In fact, Monterey’s “Cannery Row” was originally a nickname given to the area by famous author, John Steinbeck, who was inspired by the local business and wasn’t adopted as the official name until 1958. 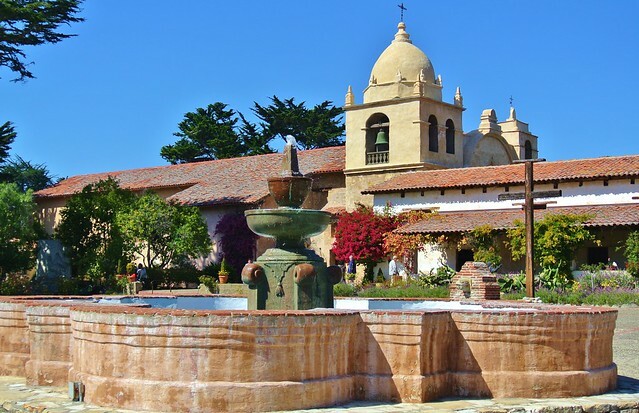 To find out more about the captivating history of Monterey, visitors are encouraged to explore the Path of History which is a two-mile self-guided tour that includes several historical sites along the way. Monterey County is best experienced in the great outdoors. Adventure enthusiasts quickly find that that there are endless opportunities to experience this varied destination by foot, peddle and paddle. Diverse hiking trails through redwood forests, ocean-side cliffs, rolling hills and river beds make Monterey County a haven for hikers of all skill levels. 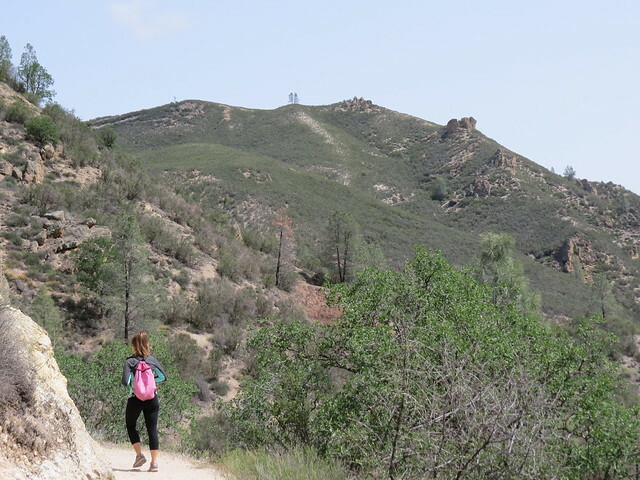 Pinnacles National Park, Pfeiffer Big Sur State Park, and Fort Ord National Monument are just a few parks with well-maintained trails and epic views. To see a larger chunk of Monterey County consider biking the Monterey Bay Recreation Trail that cruises along the coastline from Castroville down to Pebble Beach. Get up close and personal with creatures of the deep via scuba diving. Scuba divers love Monterey Bay for the unique sea life and striking underwater kelp forests. From sea urchins to sea otters and everything in between, the ocean habitats are bursting with life below the waves. For those who opt to stay above water, kayaking is a great way to experience the marine live in Monterey Bay, without having to get wet. If heights get your adrenaline pumping, take to the skies by parasailing in Marina State Beach or skydiving with Monterey Bay Skydive. Monterey County is lucky to have several beautiful beaches available for public access. Lover’s Point and Asilomar Beach in Pacific Grove are perfect stops for a beach picnic. Carmel beach not only features lovely views and soft white sands, but is dog friendly too! Del Monte beach is another dog friendly spot with a convention recreation trail and picnic tables. Last, but certainly not least, is Pfeiffer Beach in Big Sur which has breathtaking naturally occurring rock formations and purple streaks in the sand. No matter what beach you choose, a Monterey County sunset at any one of these is a sight that shouldn’t be missed! Beautiful roads winding along the rugged California coastline coupled with views of golden hills and mountain ranges; it is easy to see why so many visitors choose driving as the preferred method of getting to Monterey. Highway 1 stretches down the coast of California and winds directly through Monterey County. 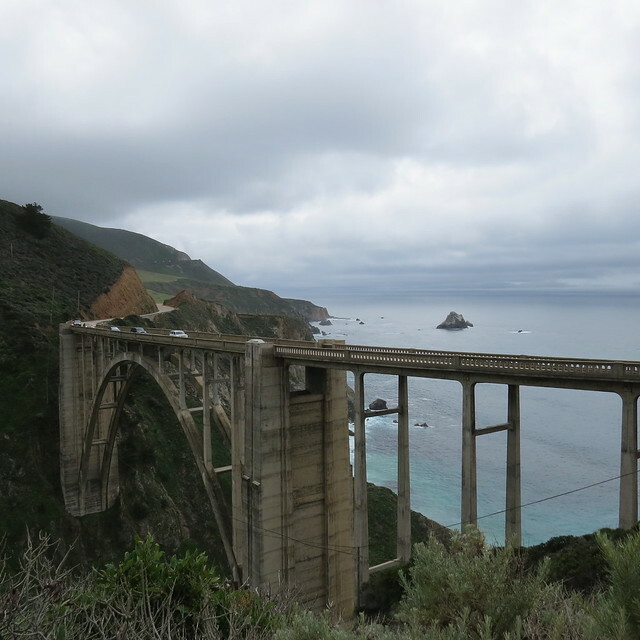 One of the most well-known sections of this iconic highway is the stretch through Big Sur and across the famous Bixby Bridge. 17-Mile Drive cuts through Pebble Beach and offers gorgeous views of world renowned golf courses, the coastline, and one of the most photographed trees in the world, the Lone Cypress.